[Luc] had a problem when he was playing with a few NodeMCU dev boards. These are too wide for a breadboard. [Luc] came up with not just one solution, but two. This is how you prototype with dev boards that are too large. The solution came to [Luc] when he realized the center of every breadboard has no electrical connections, and was simply held together by a little piece of plastic. Yes, he took a hacksaw to the breadboard. This is technically a hack. With two halves of a solderless breadboard torn asunder, [Luc] had an easy way to prototype with dev boards that are just too wide. But there is a simpler solution [Luc] realized after he destroyed a breadboard: those ubiquitous solderless breadboards have detachable power rails. If you simply take one of those power rails off, you have an easy way to use two breadboards across a module that’s too wide for one solderless breadboard. Is this a hack? Oh, absolutely. [Luc] used a hacksaw. It’s also a nice reminder of a common trick that the noobies might not know. Thanks for that, [Luc]. Solderless breadboards are extremely handy. You always hear, of course, that you need to be careful with them at high frequencies and that they can add unwanted capacitance and crosstalk to a circuit. That stands to reason since you have relatively long pieces of metal spaced close together — the very definition of a capacitor. [Ryan Jensen] did more than just listen to that advice. He built a circuit and used a scope to investigate just how much coupling he could expect with a simple digital circuit. Better still, he also made a video of it (see below). The test setup shows a single gate of a hex Schmitt trigger inverter with a sine wave input. The output transitions ring and also couple back into the input. Usually when there is a clear demand for something, some entrepreneur will fill that demand. Unfortunately, no one seems to think there’s a need for a solderless breadboard product that can handle boards that have a dual row header. These devices have 0.1″ spacing in both directions, so while they will fit in a standard breadboard, the contacts will short out the adjacent pins on the device, which makes it worthless. [Baz] needed to connect an RF24L01 module to a breadboard. Instead of connecting leads to the device or devising a breakout board, [Baz] actually hacked his breadboard. To make an area to plug in a dual row device, he took the breadboard apart, pulled the spring contacts, cut them, and then put them back in. Of course, you have to make sure the cut is wide enough that the two parts of the spring won’t touch. It looks like [Baz] used a small screwdriver to help the springs keep their shape and cut them with simple diagonal cutters. It’s no secret the Hackaday tip line gets a lot of email from Kickstarter campaigns and PR firms managing Kickstarter campaigns. Most of these are terrible products. Want a five-pound battery that can’t be recharged? Yeah, stuff like that. Every once in a while, we come across a tip that’s a completely original idea. There’s a balance between ingenuity and practicality with these ideas, and I can’t figure out where this one sits. It’s a Kickstarter for perfboard, yes, but not like any perfboard you’ve ever seen. Before we dig into this, let’s get some definitions straight. Perfboard is a sheet with holes drilled on a 0.1″ grid. The holes are plated on both sides, and each hole is an individual electrical node. 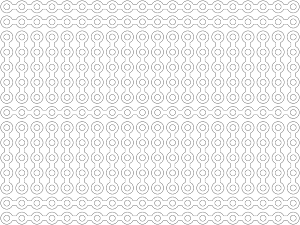 Veroboard, or stripboard is a bunch of holes on a 0.1″ grid. These holes are also plated, but all the holes in a column are a single electrical node. You can cut the tracks between holes, but the basic idea here is to reduce the number of wires needed to connect components. Busboard, seen left, is a continuation of Veroboard, and is laid out like a solderless breadboard. And so we come to the new invention, Perf+, the perfboard reinvented. This perfboard again is a series of plated holes on a 0.1″ grid. Alongside these holes is a plated bus. This bus does not connect to any hole; instead, a little bit of solder is used to connect it to holes on the same row or column. “Selective Veroboard,” you could call it. Now for the real trick: on one side of the board, the plated busses run vertically. On the other side of the board, the plated busses run horizontally. This means any two holes on the protoboard can be connected as one electrical node simply with a bit of solder. If ever there was an idea you could point to and simultaneously say, “that’s clever” and “I have no idea how to use this,” there you go. I’m pretty sure this idea isn’t better than a piece of stripboard, but it is different. If you have any idea of how to used this new, strange, and otherworldly protoboard for something useful, put a note in the comments. What is it that we like so much about inefficient, noisy clocks made with inappropriate technology? Answer the question for yourself by watching the video (below) that [David Henshaw] sent us of Dottie, the flip-dot clock. But besides the piece itself, we really like the progression in the build log, from “how am I going to do this?” to a boxed-up, finished project. Another stunning aspect of this build is just how nice an acrylic case and a raft of cleverly written software can make a project look. You’d never guess from the front that the back-side was an (incredible) rat’s nest of breadboards and Ethernet wires. Those random switching patterns make you forget all the wiring. And the servo-steered, solenoid-driven chimes are simply sweet. We’re sure that we’d love to hear them in real life. [StrangeMeadowlark] decided one day to create this badass Arduino-based gaming controller. Not for any particular reason, other than, why the heck not?! It looks like a tiny Lego spaceship that has flown in from a nearby planet, zooming directly into the hands of an eager Earthling gamer. With buttons of silver, this device can play Portal 1 and 2, Garry’s Mod, Minecraft, and VisualBoy Advance. Although more work is still needed, the controller does the job; especially when playing Pokemon. It feels like a Gameboy interface, with a customizable outer frame. Sticky, blue-tack holds a few wires in place. And, most of the materials are items that were found around the house. Like the gamepad buttons on top; they are ordinary tactile switches that can be extracted from simple electronics. And the Legos, which provide an easy way to build out the body console, rather than having to track down a 3D printer and learning AutoCAD.